Heat oil in a large, heavy bottom, pot over medium heat. Add the ginger, cinnamon, cumin and turmeric and saute for 1 minute. Keep stirring to prevent burning. Burnt spices are no fun. Add the onions, stir to incorporate and cook for 5 minutes until the onions begin to soften. Add the three kinds of beans, tomatoes and veggie broth. Stir to incorporate and bring to a boil. Lower the heat to maintain a simmer and cook for 10-15 minutes. Taste for flavor; add salt & pepper as necessary. Just before serving tear a dozen or so leaves of basil into small pieces. Transfer beans into a serving bowl. Top with toasted pine nuts and basil.. Stir to combine. This was a side dish and very filling. My husband took it for lunch with some of the Israeli couscous and was content. The leftovers held up well to reheating in the microwave. 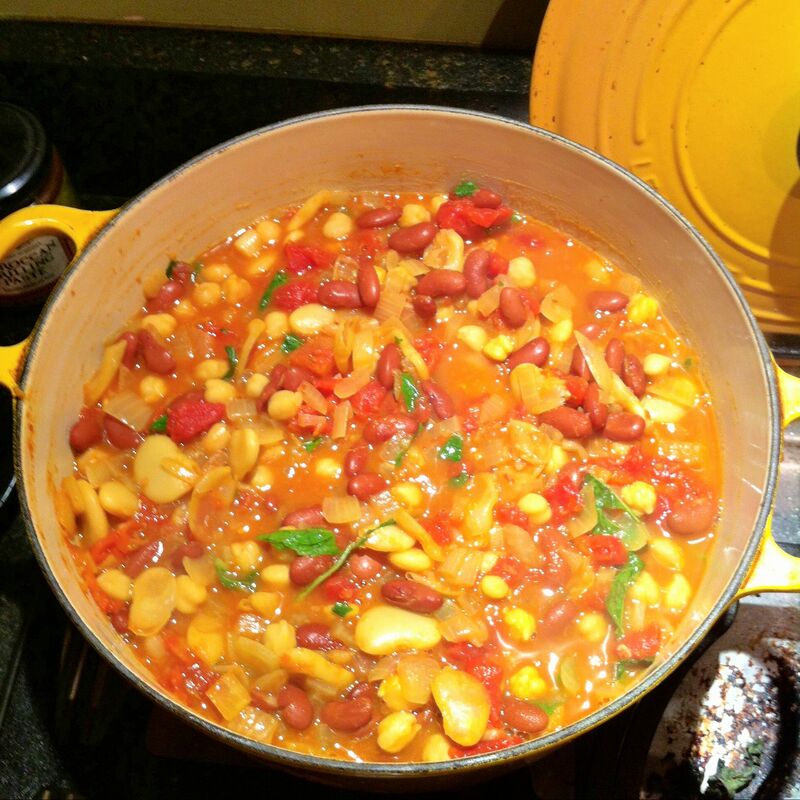 This entry was posted in Recipes, Side, Vegetarian and tagged beans, chickpeas, cumin, ginger, pine nuts, vegetarian by Bob Gill. Bookmark the permalink.